A FLUMP dredges mica from a pigment plant's setttling pond. Type of Facility: Pigment plant. February 1996. Mearl Corporation owns and operates an Automated FLUMP™ System manufactured by SRS Crisafulli. Operation is from shore based control panel. The FLUMP was used to remove mica from a settling pond at a pigment plant. Material is 8 to 10 micron size and contains small amounts of titanium dioxide. pH level in containment is 10 due to some dissolved salts. Sludge is pumped @ 19.5% solids with a specific gravity of 1.08 and a viscosity of 750 cp. This system was manufactured from A36 carbon and abrasion resistant steel. Wetted parts were coated with coal tar epoxy coating to resist corrosion due to nature of liquid in containment. 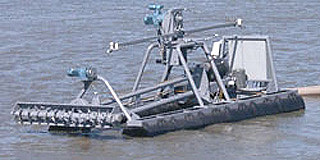 Hardwired remote control from the shore to dredge was used. Automated features are automatic reversing function, lateral move and additional inputs for level control of containment. Traverse speed and cutterhead speed were made adjustable to reduce resuspension of solids as conditions demanded.